I graduated from high school in 1964. The music I bought and played obsessively was "folk music" by groups like the Kingston Trio, the Chad Mitchell Trio, Peter, Paul & Mary and the New Christie Minstrels. I was offended when the older people I worked with at the local museum — rather contemptuously, I thought — dismissed my enthusiasm. What I thought was folk music was not what they thought it was. They were pretty much right. It didn't even occur to me that the music I liked might have any political implications. 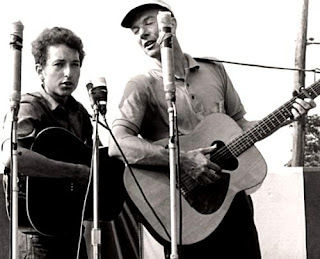 I had never heard of Pete Seeger or even of Bob Dylan. At First Things, Lauren Weiner writes about what led up to that brief period when folk music was popular music. Premiering in August 1940, Back Where I Come From featured, according to historian Robbie Lieberman, “socially conscious songs and stories, even though not explicitly ‘left’ stuff. For example, someone would sing ‘John Brown’s Body,’ and Lomax would comment, ‘There was a war that was worth fighting’”—implying, the American Civil War was good, but England’s fight against Stalin’s 1940 ally Hitler was bad. One could trace in Lomax’s comments “the CP line during the period of the Nazi–Soviet pact,” writes Lieberman. Lomax’s comrades were even louder on the point: While the pact was in force, Seeger and Guthrie wrote vitriolic anti-Roosevelt songs for the Almanacs to sing about the pointless sacrifice that lay ahead should the president send American boys against the Nazi war machine. This was, of course, months before Pearl Harbor brought the US into the war. This reversal — from vehement isolationism to equally vehement interventionism — was a marker that distinguished Moscow-lining American Communists from others on the left and right who continued to argue that the US should stay out of the war, as well as those who had been interventionist right along. This is, at least to me, a very interesting article—dealing with largely forgotten politics. I recently had a conversation with a young adult who had never heard of the Berlin Wall and didn't know that there had even been an "East" Germany — much less Americans willing to sacrifice their integrity at the behest of Communist directives. I grew up in a period when Communism was the most serious threat to human rights in the world [the Fascists having already been vanquished], and when domestic Communists were regaining a certain respectability [Joe McCarthy having thoroughly discredited naming one - even accurately]. Where you stood on Communism mattered a lot, and I find it impossible to admire Americans who were its acolytes. I still enjoy folk music, although more authentic varieties, and I'm grateful that, whatever their motives, people like Lomax did a lot to preserve it. I also enjoy some songs by ideologically driven "folk singers." For instance, "This Land is Your Land," even knowing it was written as an answer to "God Bless America," which I also like. And many folk songs have little to do with politics at all. Everything isn't political — something Bob Dylan realized long ago—even before he went electric—to the chagrin of the true believers.